Episode 179 â€“ What Caused the 3/11 Earthquake? Japan is just tallying up the damage from the devastating earthquake that struck off the northeast coast on March 11th, but it is clear that this was one of the most powerful earthquakes in modern Japanese history. Now, some are asking whether this was a natural earthquake or if it was precipitated by human activities. Join us this week as we go in search of a man-made fingerprint on the 3/11 earthquake. Description: A list of links to online resources for news and information about the Fukushima nuclear crisis. Description: An international NGO that is assisting local NPOs and community groups in delivering emergency aid and supplies to those effected by the earthquake. NOTE: They admit that 20% of all donations will be kept back for management costs. Description: An organization promising to use donations to help pay for solar powered LED lanterns, community radiation monitoring stations, low energy cooking equipment, etc. Description: The earthquake was so powerful it shifted the earthâ€™s axis about 6.5 inches and caused the earth to rotate faster, shortening the length of the day by about 1.8 microseconds. Description: A time-lapse map showing the time, depth and strength of all 800+ earthquakes to effect Japan since March 11th. Description: A report from the Japanese national broadcaster on what was happening tectonically during the earthquake. Description: An extensive USGS report on the background, causes and effects of the 9.0 earthquake. Description: Watch for Danny Glover to win a Nobel for this valuable scientific opinion. Documentation â€“ Does climate change mean more tsunamis? Description: A direct link to the â€œProgram Purposeâ€� section of the official HAARP homepage. Description: Utterly fact-free string of unsourced innuendo that never bothers to explain anything whatsoever about what HAARP is, how it operates, how it can cause earthquakes, how its signature can be detected in any given earthquake, or how we know it was employed in this particular earthquake. Enjoy. Description: A somewhat more fact-based look at HAARP and its capabilities. Description: The US Defense Secretary casually announces that groups are developing weapons to alter climate and set off earthquakes with electromagnetic waves. Description: WikiWorldOrderâ€™s take on the possibility that HAARP was used to set off the earthquake. Description: A woman appears to predict the 3/11 earthquake. Description: A man appears to predict (post-dicts?) the 3/11 earthquake. Description: From February 21, 2011. Description: Earthquakes, Solar effects and Lunar Modulation, Forecasting. Re: Japan Disaster Coverage by James Corbett: What Caused the 3/11 Earthquake? This is James Corbett of corbettreport.com with your Sunday Update for this 27th day of March, 2011. And now for the real news. Now the spread of the radioactive contamination has been discovered to be even worse than previously thought, with radiation levels over 30 kilometres away from the plant found to be 40% higher than the annual radiation limit set for the general public. This comes on the back of reports yesterday showing that radioactivity in seawater samples taken within a few hundred meters of the plant contains concentrations of radioactive iodine-131 over 1200 times higher than the legal limit. The Japanese government updated that figure earlier today to show that that number has again increased, with radioactivity levels now over 1800 times higher than legal limits. Official assurances that these readings and reports do not pose a significant risk to the general public are wearing thin as more evidence emergences of obfuscation and coverup by TEPCO about what is happening at the plant. Yesterday TEPCO officials acknowledged that they had covered up the high radiation levels in the underground levels of the turbine building of one of the reactors, and that they had deliberately withheld that information from pertinent third parties. Last week Hirose Takashi, a researcher at the Aomori Prefectural Industrial Research Institute and a man who has written extensively on nuclear power went on Japanese TV to point out the lies that are being told about the supposed safety of this radiation. Many are now expressing concern that the Japanese governmentâ€™s moves to quietly raise legal radiation limits in a number of areas indicates a tacit acknowledgement that increased radiation exposure will continue to be a daily reality for residents of Japan for the foreseeable future. On March 17th, the government raised the radiation exposure limits for emergency workers at the Fukushima plant from 100 millisieverts to 250 millisieverts. On March 22nd, the government announced that they were raising the bar for access to decontamination from 6,000 counts per minute to 100,000 counts per minute. And now the International Commission on Radiological Protection is recommending that the Japanese government raise allowable radiation exposure limits for the general public from 1 millisievert per year to 100 millisieverts per year, not because the fundamental laws of physics and human biology have changed, but to stop people from moving out of the effected areas. Meanwhile in the American media, some are now attempting to make fun of the situation, actually saying that increased radiation levels are good for you. Ann Coulter on how Radiation "is actually good for you"
Infowars.com has contacted Ann Coulterâ€™s staff to offer to pay for a first class flight to Tokyo and to pay her usual speaking fee to go to the site and drink the radioactive water there, but Coulter has so far refused to do so. Here are some online resources related to the nuclear crisis unfolding at the Fukushima Nuclear Reactor in Japan and its radioactive effects. Please contact me if you know of any other valuable online resources that could be added to this list. Kyodo News â€“ Nuclear crisis â€“ The latest news and information in English on the nuclear crisis from the Kyodo news service. NHK World English â€“ Video and text news reports from Japanâ€™s national broadcaster in English. World Nuclear News â€“ A nuclear event news website with extensive Fukushima coverage recommended by Dr. Najmedin Meshkati. Information about 2011 Tohoku â€“ Pacific Ocean Earthquake â€“ Includes information on radioactivity from the Ministry of Health, Labour and Welfare. Information for Foreigners on 2011 Tohoku-Pacific Ocean Earthquake â€“ Links to various Japanese government agencies and other official sources of information on the crisis. Reading of Environmental Radioactivity Level â€“ Supplied by the Ministry of Education, Culture, Sports, Science and Technology of Japan, this resource includes links to readings of radioactivity by prefecture. 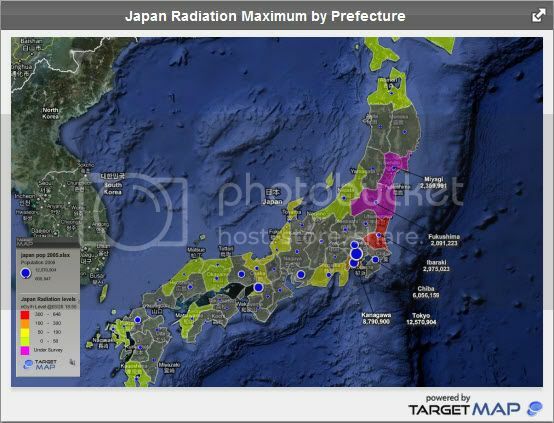 Japan Radiation Counters Map â€“ Independent radiation monitoring around Japan compiled by RDTN.org. Monitored data on environmental radiation levels in Tokyo â€“ Provided by the Tokyo Metropolitan Institute of Public Health. Earthquake and nuclear crisis in Japan â€“ Information on radioactivity from Fukushima crisis by the French IRSN. EnviroReporter.com Radiation Station â€“ A live ustream video of a radiation monitor in Santa Monica. Radioactivity Air Sampling in California â€“ Provided by the UC Berkeley Nuclear Engineering Department. Online Geiger Counter Nuclear Radiation Detector Map â€“ A map of online geiger counter readings in North America.